The Avengers assembled after the Black Panther discovered that the Earth was affected by the incursions, a multiversal phenomena that caused the periodical collision between realities. In an attempt to stop the the latest incursion, the Illuminati assembled the Infinity Gauntlet. 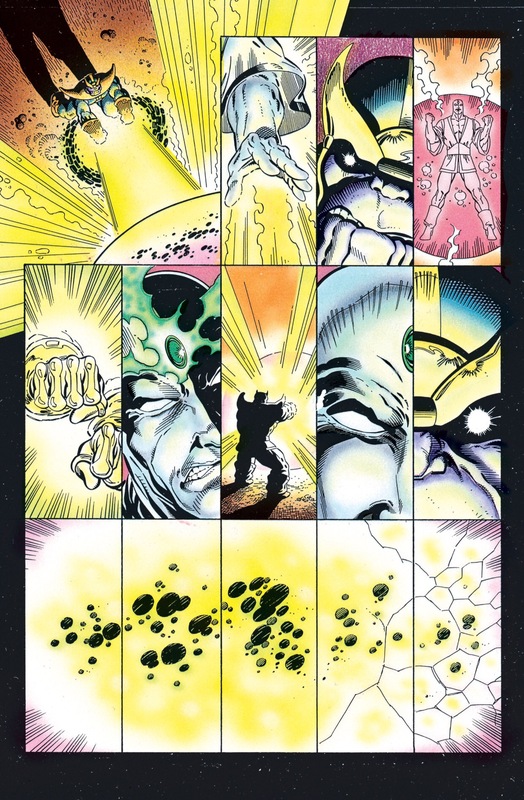 Even though Captain America managed to prevent the incursion, all the gems shattered, with the exception of the Time Gem, which simply vanished. The Time Gem unexpectedly returned some time later and transported the Avengers through time. During each time jump, the Gem returned more of the heroes back to the present until only Captain America remained, who was rescued by Iron Lad. 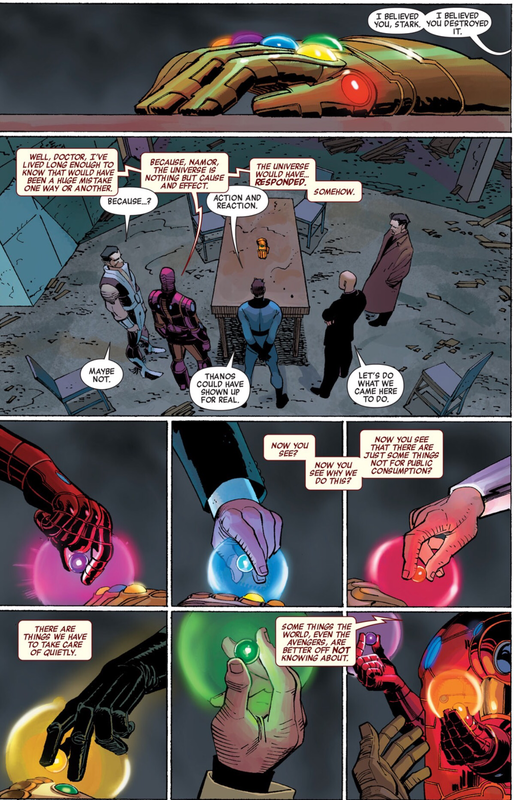 Following a confrontation against Iron Lad and his future counterparts, Kang the Conqueror and Immortus, Captain America retrieved the Time Gem and used it to return to the present, though it vanished again afterwards. 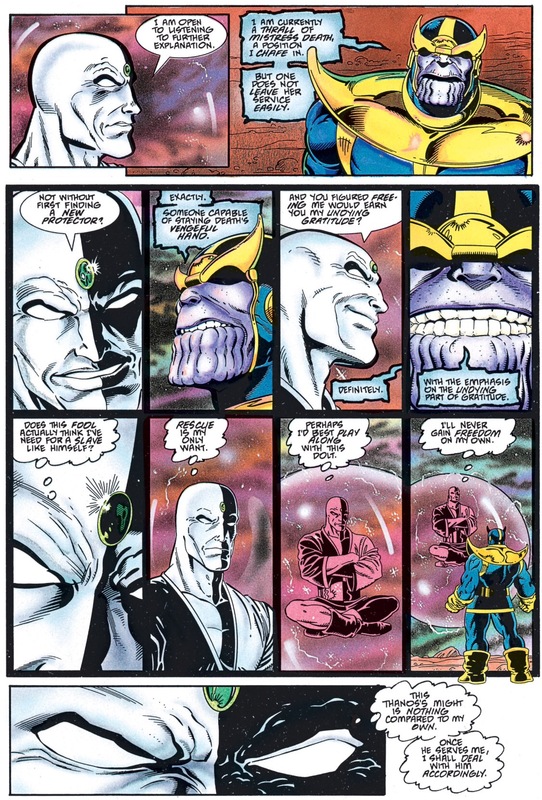 Following the destruction of the entire Multiverse and its eventual restoration, the destroyed Infinity Gems were recreated and scattered across the universe. The Collector and the Grandmaster allied themselves with the Guardians of the Galaxy to find the stones, as they believed they held the key to learn more about the destruction and restoration of the universe. 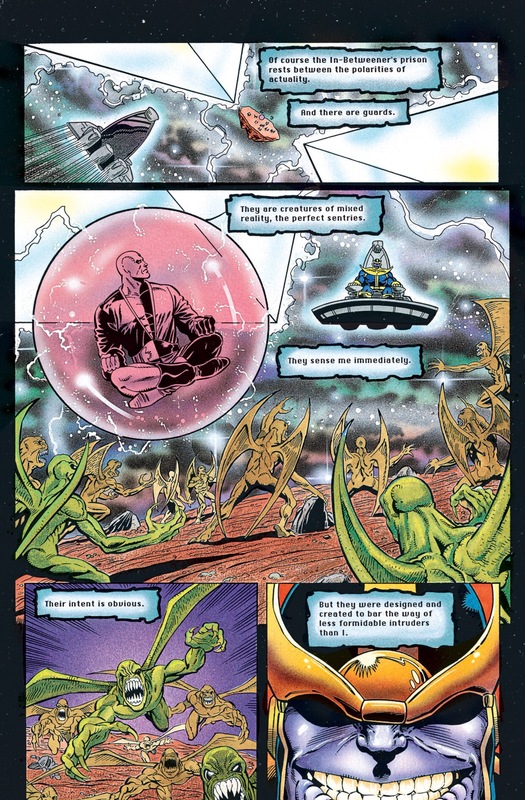 This was because from the point of view of its inhabitants, this process occurred in a blink and went mostly unnoticed, and only powerful beings such as the Elders could sense traces of the mysterious re-ordering the cosmos had suffered. The Space Gem (now colored blue) appeared mysteriously in a S.H.I.E.L.D. 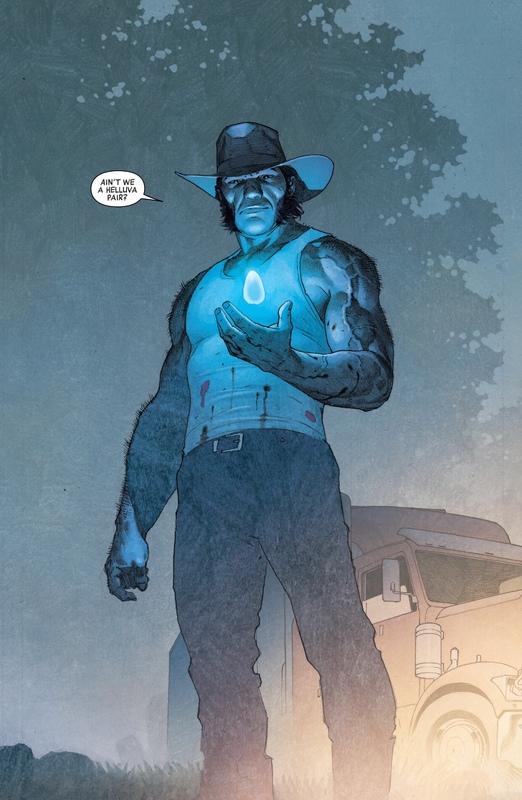 storage facility, with a failed attempt from Loki’s part to retrieve it resulting in the gem ending up in the hands of Wolverine. The Power Gem (now colored purple) manifested in a giant-size in the desert planet of Xitaung, where it was found by the Nova Corps who are being assisted by The Guardians of the Galaxy. 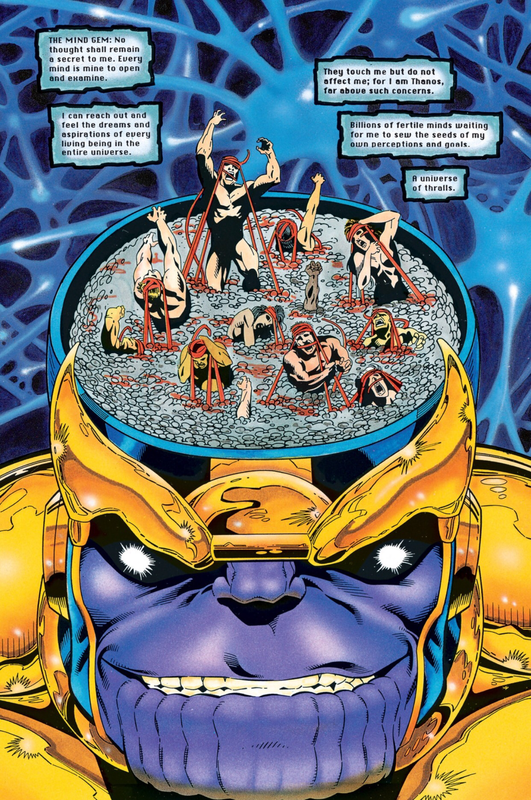 The Thanos Quest is a two-issue comic book limited series published in September and October 1990 by Marvel Comics. 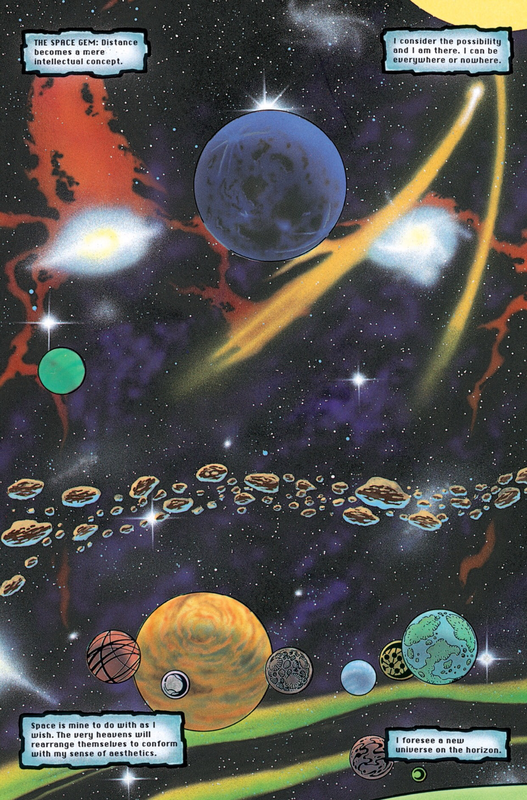 The series was written by Jim Starlin, and drawn by Ron Lim. 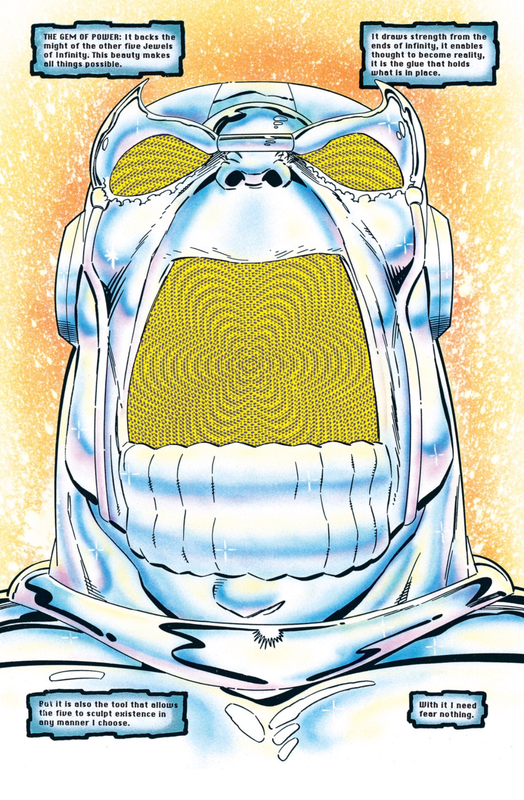 The story line is a continuation of the events – involving resurrected Starlin-character Thanos, featured in the title Silver Surfer. The story line leads directly into three consecutive limited series, The Infinity Gauntlet, Infinity War, and Infinity Crusade. 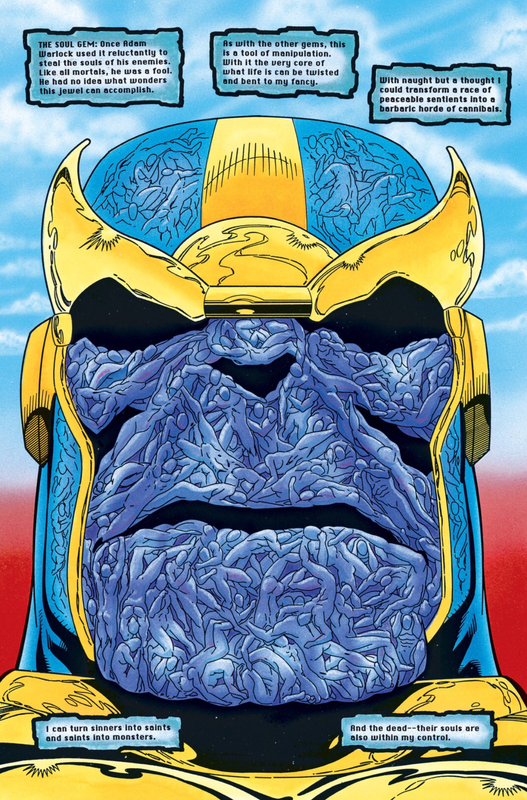 Recently resurrected by Death in order to wipe out half of the population of the universe, the Titan Thanos discovers the true nature of the six Infinity Gems after gazing into Death’s Infinity Well. Convincing Death that possession of the gems will aid him tremendously in his quest, he gains her permission to seek them out from the cosmic entities that currently possess them. 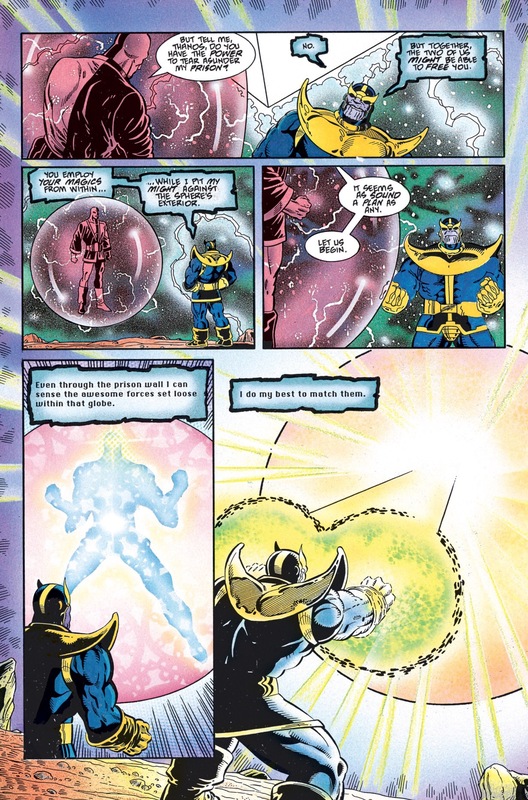 In Part One of the Thanos Quest, Thanos first travels to the Nexus of Reality where the “concept being” known as the In-Betweener is being imprisoned by Lord Chaos and Master Order; after freeing him from the sphere in which he is being incarcerated, Thanos forcibly takes the Soul Gem from the In-Betweener, whose powers are useless at the heart of the realm of Chaos and Order. By the In-Betweener’s own admission, he represents duality itself, specifically in respect to concepts such as good and evil; reason and emotion; truth and illusion; and life and death. The In-Betweener is also an agent of the conceptual beings Lord Chaos and Master Order, although his loyalty is usually to himself rather than to them. 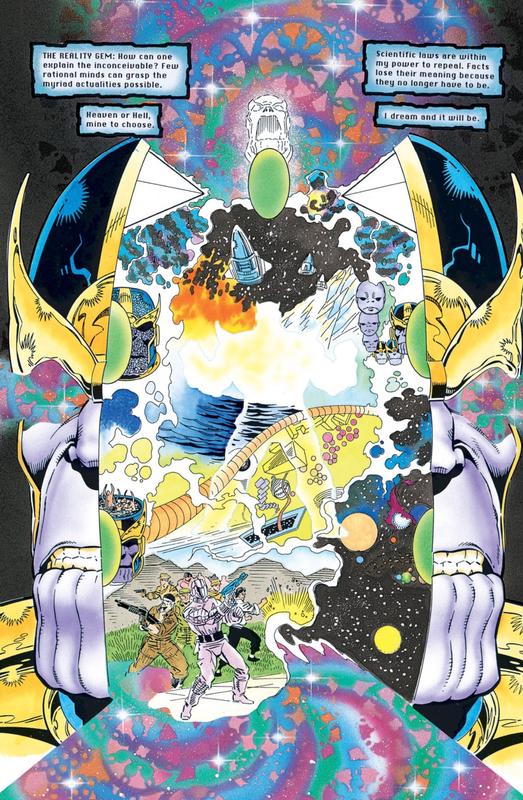 In addition to being an incarnation of balance and duality, the In-Betweener is possibly a metaphysical counterpart of Galactus. 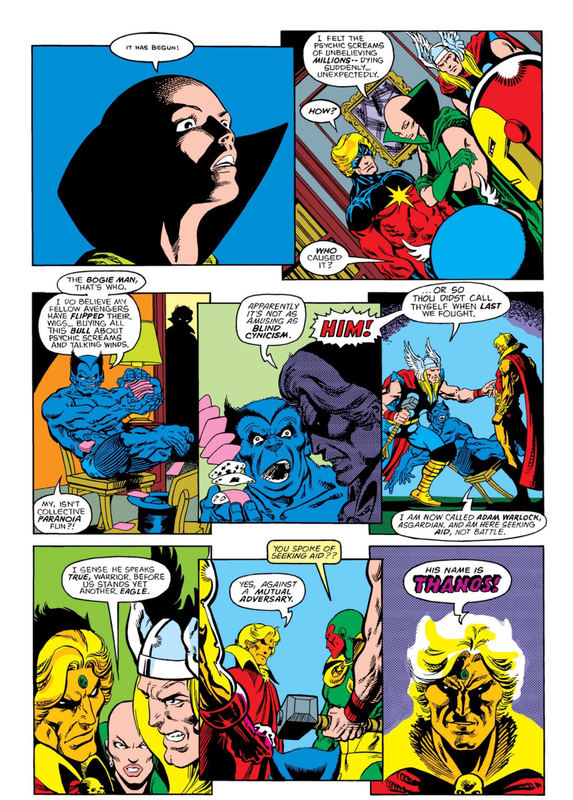 The hero Adam Warlock is the first Terran meta-human to encounter the In-Betweener, and the entity reveals that it is destined to force Warlock to transform into his villainous future self the Magus. 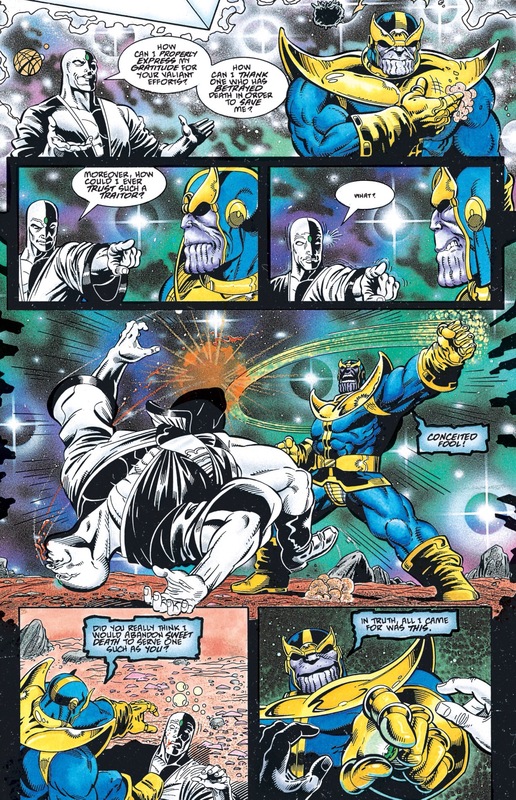 Warlock, however, was able to escape this fate with help from the Titan Thanos. The In-Betweener then claims to be the power behind the plan to alter the fabric of reality orchestrated by the group of sorcerers known as the Creators, but secretly seeks to impose his own concept of balance upon the universe. After an encounter with the sorcerer Doctor Strange, the In-Betweener is imprisoned as punishment for rebelling against his masters. 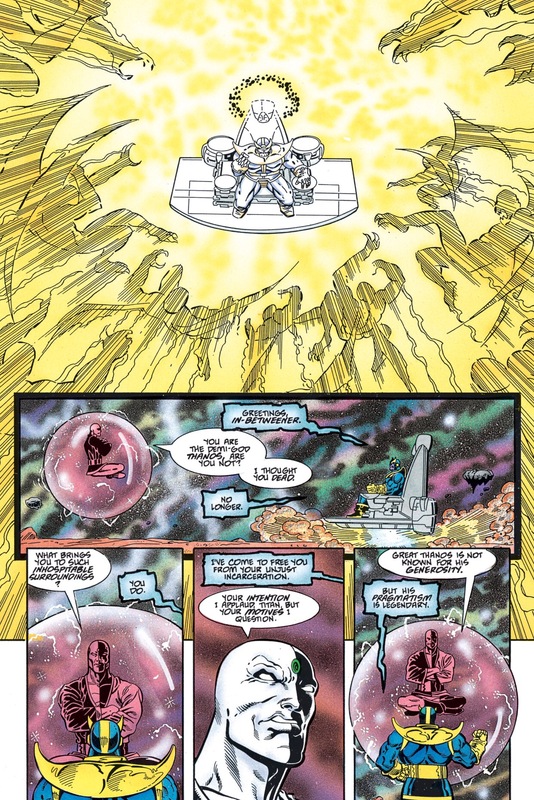 The In-Betweener later attempts to supplant Galactus’ role in the universe and allies with the Elders of the Universe in their plan against Galactus. However, the In-Betweener betrays the Elders during a confrontation with the entity Death and compels Death to wipe three of the Elders from existence. Soon after this the In-Betweener also battles Galactus and his robotic servant the Punisher, but the stalemated battle is interrupted by his masters, who subsequently imprison him. He is later freed by Thanos, who secretly desires the Soul Gem the In-Betweener wears, as it is one of the six Infinity Gems. 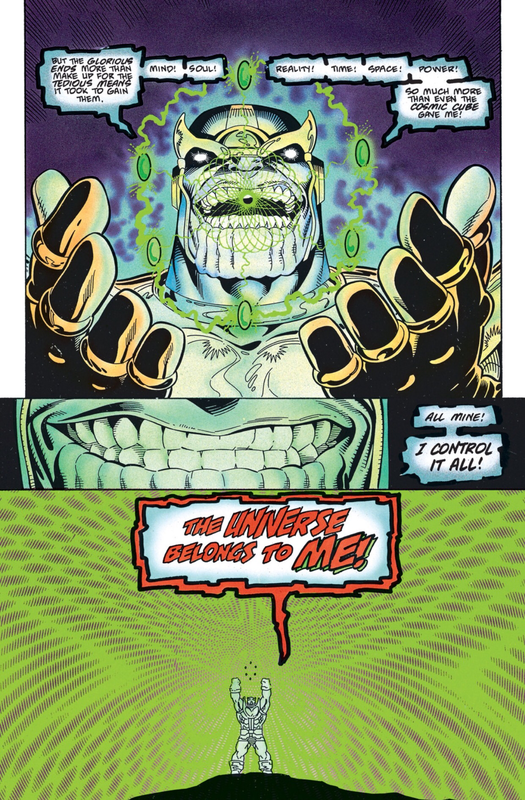 Thanos then steals the gem and abandons the In-Betweener to face the wrath of Lord Chaos and Master Order, who discover he has escaped his prison. Thanos Takes the Reality Gem from The Collector. 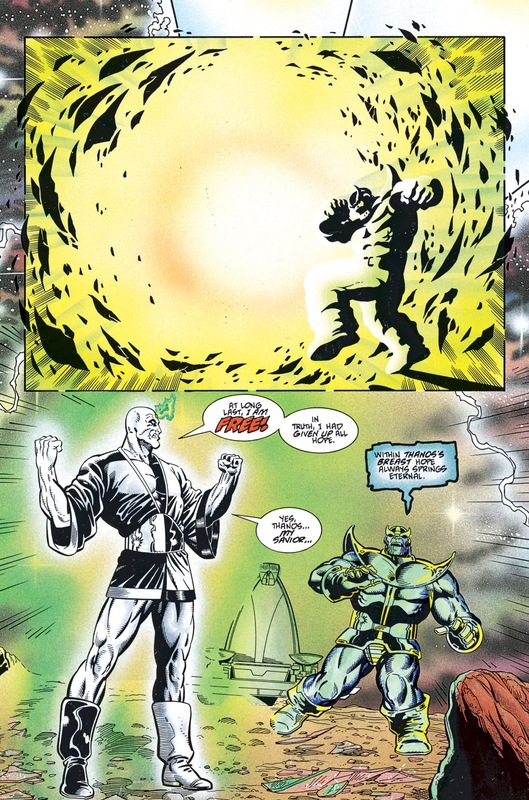 Thanos Steals the final Infinity Stone, The Mind Gem, from The Grandmaster. 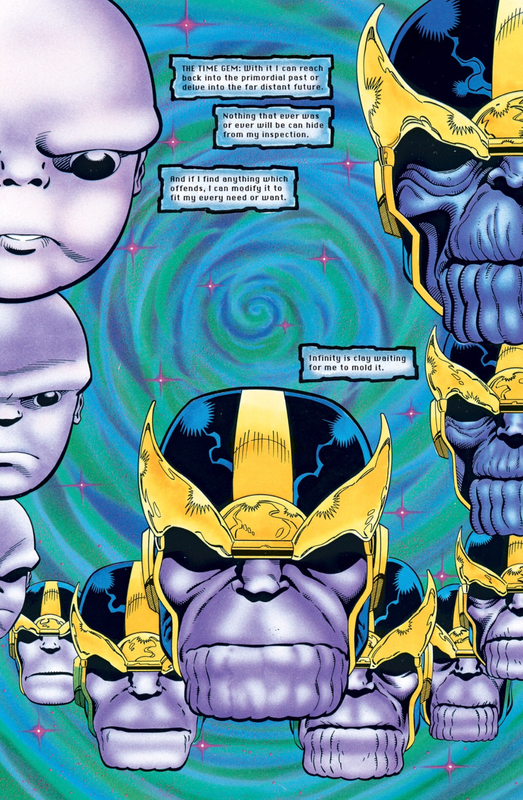 This entry was posted in In-Betweener, Infinity Gems, Infinity Guantlet, Soul Stone, thanos and tagged Champion, Grandmaster, In-Betweener, infinity gems, infinity quest, infinity stones, soul gems, thanos, The Collector, The Gardner, The Runner on May 8, 2016 by lowbrowcomics. Tony Stark distributes the Infinity Gems to prevent them from falling into enemy hands.